Jesus Christ himself won’t be the only undead supernatural being wandering around this Easter Sunday, as Ash, Pablo, Kelly and the rest of the gang continue their now three-season-long quest to send the demonic Deadites back to Hell on Starz’ Ash Vs. Evil Dead. We’ve got an exclusive clip from this week’s episode, here to make your Good Friday even better with some delightfully gnarly practical creature effects. 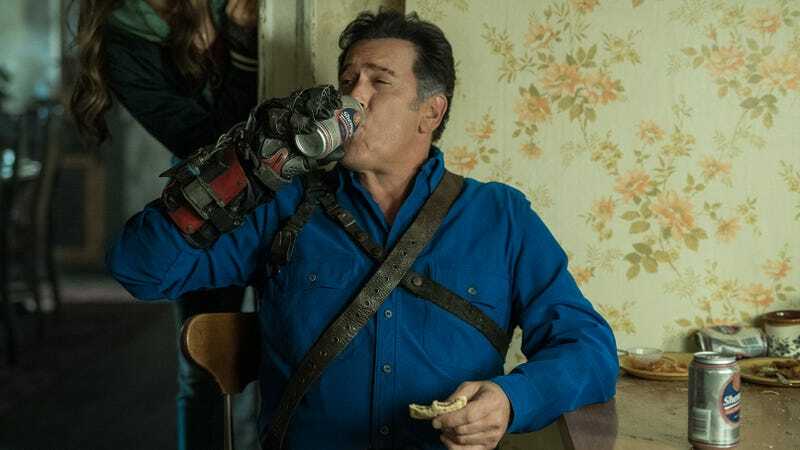 In the clip, Ash (Bruce Campbell) and Pablo (Ray Santiago) battle what appears to be a Deadite janitor with an infernal case of cystic acne and a mutated twin growing out of his right shoulder; once again implored to “join us” by his possessed adversary, Ash quips: “I’m good. I joined the Elks.” You’d think they would have gotten the hint by now. There’s no telling whether Ashley Williams will finally defeat the Deadite menace for good on this weeks episode of Ash Vs. Evil Dead, but considering there are four more episodes left in this season, we’re going to go ahead and guess that he doesn’t. Better tune in to Starz this Sunday night to find out. Ash Vs. Evil Dead returns from the cellar with a groovy new "Family"